Kefyalew Alene is a spatial epidemiologist with interest in infectious diseases including tuberculosis, multidrug-resistant tuberculosis, and emerging infectious diseases. He recently submitted his PhD at the Research School of Population Health, Australian National University. He is currently a Research Fellow at Curtin University, with joint appointments at Telethon Kids Institute as Honorary Research Fellow Team Member. 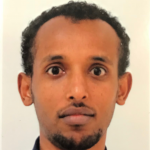 He is also a Visiting Research Fellow at the Department of Global Health, Australian National University and an Assistant Professor of Epidemiology and Public Health at the University of Gondar, Ethiopia.